"It is wonderful," Dr. Corminboeuf said of the Virtua. "We are able to record CDs so much faster than we ever did-and for less cost." In many nuclear medicine departments, fundamental processes and their resulting costs are reducing overall staff efficiency while cutting into the increasingly essential bottom line. At Inselspital University Hospital in Bern, Switzerland, an innovative new medical disc publisher from Codonics is changing that picture in a big way. In fact, the Virtua™ Medical Disc Publisher has led the nuclear medicine department out of the realm of time-consuming manual CD recording and into a world of heightened efficiency. The results have been amazing. Radiologists who once had to leave their workstations when technologists needed to record a CD are now able to continue their clinical work without interruption. And, technologists can burn discs in a matter of seconds compared with a process that once required up to 15 minutes. The Virtua Medical Disc Publisher is marketed by Codonics, Inc., a U.S.-based global supplier of dry diagnostic medical imagers and CD/DVD disc publishers, as "the fastest burner on the planet." The staff in the nuclear medicine department at the hospital supports that claim, especially Frederic Corminboeuf, Ph.D., chief medical physicist for the nuclear medicine department. Before Virtua was implemented, the department used a rudimentary process to record images on CDs from a workstation, much like consumers using a standard personal computer. The process was an involved one, quality was inconsistent, and CDs often failed to record data at all. Additionally, discs had to be recorded individually. And when requests came in to duplicate a disc that had previously been recorded, the process had to be initiated all over again. To make matters worse, physicians were constantly being interrupted from their clinical work, and technologists were unable to attend to patients when CDs had to be burned. "We had to record discs one after another, and it was very inefficient," Dr. Corminboeuf said. "Then, we had to print the label and apply it on the CD. The process was completely manual. It took us up to 15 minutes to record one CD, and we were recording 10 to 15 CDs per day." Most CDs are recorded for referring physicians, who can view them with ease when necessary, easily maintain them in the patient record, and send them to specialists without difficulty. Now with Virtua, the disc is the primary illustration of the report, and the hardcopy is a complement. "Virtua's CDs look very professional," Dr. Corminboeuf said, adding, "For PET/CT, where the data is so substantial, we no longer have to send along only highlight pictures-we can send all the data as well. That's very important when you're dealing with cancer, where you need a full view of the disease. Virtua has definitely helped our relationship with referring physicians." There have been other benefits. Radiologists have gained back the time that they lost when CDs were recording, technologists have recovered several hours of exam time per day, Virtua never fails to record data, and the cost savings has been significant; the department is saving more than $15,000 per year using Virtua. In addition to the speed they were looking for, the department needed to send data from its own PET/CT workstation. That required a viewer that would allow the viewing of fused pre-registered data. Codonics representatives in Switzerland configured Inselspital's Siemens Biograph PET/CT and installed a DICOM compatible viewer that enables clinicians to read nuclear medicine studies as well as data from the department's PET/CT and SPECT/CT systems. "We had to find a good viewer to use with the system," Dr.Corminboeuf said. "We needed one with a fusion capability, and Codonics was very helpful in seamlessly integrating the viewer in our Virtua." Virtua's features and capabilities include fast, on-demand recording and labeling, compatibility with datasets from virtually all modalities, fully automatic operation right from modality workstations, and a compact footprint. Virtua's compact, all-in-one design and touch screen eliminate the mess of disorganized cables and a separate monitor, keyboard and mouse. A 'direct to disc' feature, which Inselspital hopes to implement, will enable recording of PowerPoint presentations along with images and other non-DICOM files for distribution at medical conferences. 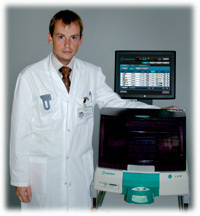 At Inselspital, staff are able to record entire studies onto one or two CDs, or if they wish, could record to one DVD. Two CDs may be recorded simultaneously which enables the department to record all of its CDs for an entire day in one hour. Using its former manual process, up to four hours were required to complete the same number of CDs. "Now, our technologists can concentrate more on the medical exam rather than on the production of CDs," Dr. Corminboeuf said. "They're doing more of what they were trained to do. Our doctors like Virtua, too, because they're not being interrupted like they once were." At Inselspital, under the leadership of Prof. Dr. med. Thomas Krause,10 radiologists staff the nuclear medicine department. Each year an estimated 6,000 nuclear medicine exams and up to 1,700 PET/CT scans are completed. The department treats more than 5,500 patients per year. More information on Inselspital can be found on-line at www.drnwueb.insel.ch/nukmed.html. According to Dr. Corminboeuf, Virtua was affordable, has performed reliably, and is inexpensive to operate. Clearly, the Codonics Virtua has done everything that Inselspital's nuclear medicine department expected-and more. "The Codonics system is excellent, and has really benefited us on several fronts," Dr. Corminboeuf said. "Not only has it freed up our radiologists and technologists to focus more on the clinical work, but it has helped strengthen the relationships with our referring physicians. And, it has saved us money, which today is very important. We couldn't be happier with the performance and other benefits of the Virtua recorder."